GiULiA is an initiative of the World Bank Group to improve urban logistics macro-planning. The current version of the tool focuses on urban logistics associated to e-commerce. The tool was designed in a flexible way using basic geographical and logistics information. Giulia allows to carry out sensitivity analyses, evaluating impacts of different types of policy interventions, considering both operational and environmental benefits through the establishment of indicators. Practioners can use this tool to identify tradeoffs, assess high-level impacts of certain measures and narrow down to policies that can bring both operational and environmental benefits for the context of the specific city. These measures have then to undergo a more in-depth analysis for implementation, with simulations at the micro-level. Over the past decades, the world has seen a growth in the size of cities and in the number of people living in urban areas. According to the UN report, 54% of the world’s population lived in urban areas in 2014, and their projection indicates a growth up to 66% until 2050. This situation is even more intense in Brazil. According to the Brazilian Census data of 2010, 84% of the population already live in urban areas. This concentration of population in cities also implies a growing number of vehicles in urban areas, which generates congestions, air pollution and noise, which affect traffic safety, quality of life and economic competitiveness negatively. Even if the e-commerce, in principle, can replace the individual displacements for shopping for people living in cities, the transport of goods provided by this type of trade involves the movement and heavier vehicles to meet the sprayed demand. In Brazil, in recent years there has been a large increase in terms of volumes and values. Although in the year of 2015 the Brazilian economy was in recession, there was a growth in the number of orders and mainly of shopping values, as shown in the eBit/Buscapé  report . In addition, that report points out that the offers with free freight have been reduced and the time promised for delivery grew from 8.7 to 9.4 days last year. Many strategies and policies have been implemented to improve urban mobility, but the focus was generally addressed to passenger mobility and transportation. Freight transport in urban areas is often missed in the analysis, despite being a key factor to reach urban sustainability. The recognition of the need of better data to support decision-making has generated some innovations towards electronic data collection tools such as GPS. Particularly, in the city of Sao Paulo, an unprecedented survey is being done in order to understand the dynamics of freight movement within the city of Sao Paulo. This first survey of freight origin and destination in the city is an important tool in understanding the logistics of each economic sector , evaluating the investments impacts in the logistics infrastructure and policies to manage congestion and emissions. To solve this kind of problem, a literature called city logistics has been developed to address the process of logistic activities in urban areas. The evaluation of solutions is as important as the implementation. The urban space is heterogeneous and each place works in different ways. Thus, it is important to take into account the differences in urban form to better understanding the impacts of the solutions in the local context as a form to choose the best set of solutions. For this purpose, the use of Geographic Information System (GIS) is useful as it enables the interaction between the local data features and urban form with transportation data. Moreover, with the inputs of some interventions analysis this tool could allow the simulation in urban logistics, becoming an important tool for urban planning. An important mechanism in the support of economic activity is the commerce. It has the objective of removing several types of hindrances in the process of exchange of goods. Over its history, commerce has faced significant advances that led to efficiency improvements for society, which is the removal of barriers between producers and consumers. In the last decades, developments in information and communication technologies (ICTs) and the internet have led to a structural change in commerce. Businesses saw the opportunities in using the internet to conduct trades, breaking some barriers, such as time, and entrance cost. The term electronic commerce, hereafter denoted as e-commerce,emerged to refer to this type of business transactions that take place over the internet. “E-commerce is the sale or purchase of goods conducted over the internet by methods specifically designed for the purpose of receiving or placing of orders. Even though goods are ordered electronically, the payment and the ultimate delivery of the goods do not have to be conducted online. An e-commerce transaction can be between enterprises, households, individuals, governments, and other public or private organizations. Not included in these electronic transactions are extranet or electronic data interchange orders. The type of transaction made is defined by the method of placing the order. Normally excluded are orders made by telephone calls, fax or manually typed e-mails”. From this definition, the transactions of services are excluded from the analysis of e-commerce. This emphasizes the fact that we are interested in transactions of goods, the ones that generate physical movements of merchandise in the city. Therefore, the online purchase of services, such as travelling tickets, cultural and sports events, or digital music or books and so on, despite being online trade, do not generate a receiving good and are not considered in such analysis. Another point to be clarified refers to a new technology used in online shopping, which allows a consumer to complete a commercial transaction using a mobile device. In the literature, these types of transactions have been separated, referring to the internet trade as e-commerce and the trade trough mobile devices as m-commerce. Like e-commerce, in the transaction of goods, m-commerce also generate deliveries in the city in a similar form. Online shopping has produced major proximity between consumers and producers, not in a physical way, but through the internet. Before, businesses were confined to a specific area, mostly reached by the population surrounding them. E-commerce enlarged the scope of the market. Businesses nowadays can connect with consumers almost anywhere, in ways that were not previously possible. Hence, e-commerce is lowering operating barriers and costs. The OCDE (2013)  asserts that for consumers, “e-commerce confers benefits by providing information on goods and services, helping consumers locate sellers, facilitating price comparisons, offering convenient delivery, and allowing them purchase easily via a computer or mobile device wherever they are”. In addition, we add, at any time they want, because with the online shopping, stores are opened 24 hours a day. Hesse (2002)  suggests that “most innovations by e-commerce refer to the ‘front end’: the way goods or services are being ordered by costumers and how they are successfully marketed in a highly competitive environment”. In traditional commerce, a marketplace is a physical place in which the consumer needs to visit to complete the transaction, resulting in the movement of individuals. According to Okholm et al. 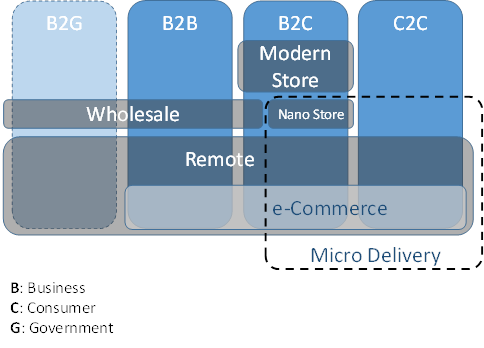 (2013) , , e-commerce is characterized by its ubiquity, that is, it is available just about everywhere, at all times. It liberates the market from being restricted to a physical space and for consumers; the ubiquity reduces their transaction costs, since it is no longer necessary to spend time and money traveling to a market. However, goods need to be delivered somehow. Therefore, instead of individual displacement of consumers, goods are delivered by freight transportation. E-commerce delivery chain is a rather complex business involving other stakeholder groups and a variety of agreements and business models. An important question that emerges is regarding the understanding of the impact that this change could have in the city logistics and in the environment. B2G – business to government: B2G networks provide a platform for businesses to bid on government opportunities. Transactions encompass products to various government levels (federal, state and municipal). Generally, the government negotiates standing contracts for a certain period and a set of prices (NEMAT, 2011) . B2B - business to business: transaction between two businesses, such as between manufacturer and a wholesaler, or a wholesaler and a retailer. The World Bank report states that the most common form of B2B e-commerce “is an e-Wholesale Marketplace where sellers are granted access to a much wider market and buyers can cut costs in their supply chain by being able to compare prices in a transparent way”. B2C – business to consumer: happens when a business sells directly to the end consumer. This transaction involves a variety of methods; it could take place in different internet platforms and generate distinct kinds of delivers, depending mostly on the characteristics of the product and the time required for delivery. C2C – consumer to consumer: transaction that take place between two consumers. The internet has enabled the creation of Online Marketplaces, where anyone can offer a product. Examples of these platforms are Mercado Livre and eBay. “The sites are only intermediaries, just there to match consumers. They do not have to check quality of the products being offered” (NEMAT, 2011). Generally, the shipment uses the services of a third party, such as Correios or other logistic operators. GIULIA focuses on consumers, in particular on consumers buying physical goods through the internet from online stores, which is the B2C transactions. The GIULIA model intents to be as effective as possible to represent the actual behavior, but subject to the restrictions of available information. Operate under open GIS software platform and whenever possible with available public data. In short, the system allows the use of digital maps for presentation of data and to do queries using available georeferenced information, offering a georeferenced vision linked to simulation tools and analysis of impacts. Be an agile instrument for contributes to the activities of planning and management of urban logistics. Include a mathematical model for simulation and evaluation of impacts from scenarios with urban logistics interventions. Public data : data from demographic census database, as personal information (counting, tender, age, location, education) and households information (quantity, location and income). Benchmark interventions : information about the urban logistics interventions types and their characteristics that could by applied in the context of urban logistics. In addition, it has been considered that, always as possible, the database model was prepared to apply to other cities around the world. The metadata, also referred to complement the GDB, constitutes reference information of the GDB, as a dictionary that describes the data in detail, units of measurement, sources and methods of obtaining. These aim to characterize the data held in the system, allowing their proper use and its processing to generate new information. The entire GDB is supported by a set of extensive enough metadata to document the data, however limited the attendance of serviceability of the GDB. The major challenge is getting specific data related to demand and transport services in the city, adding to the guideline that it could be compatible to other locations in distinct countries. Thus, the flatness of granularity and diversification of information had to be measured so as not to restrict the developed model, while ensuring flexibility of application to other cities and countries. In addition, this type of model, aims to assess situations and operational actions whose measurement depends on the sensitivity of the model that requires a granularity of information is limited to the availability of data. Thus, the model suits the details of the data and dynamics of the impacts of actions to be evaluated. Since it'svery difficult to obtain detailed micro data for the demand and logistics operations, the model is based on aggregated data. Thus, it is used geographic zones as units to aggregate the demand and logistics operation for the model. Similar to this geographic aggregation, also the products considered for the e-commerce demand is aggregated to products categories for the point of view of the demand and other re-aggregation for logistics operation based on possible deliver consolidations. 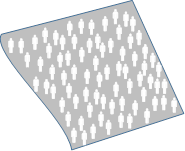 For demographic data, also, the population is aggregated in groups, based on income. In addition, the time considered in logistics operations in a day is segmented in periods, like peak or off-peak period. The vehicles considered by the model, also are aggregated in basic vehicles types compatible with the availability of operational data. Calculation of the Impacts , resulting from logistic operation simulated and impacts’ parameters. Impacts : calculated from the routes results and applying the unitary factors. About the demand destination, it´s known that there´s a portion of the demand that, though, the consumer is an individual, he can order to deliver at his work address, instead of his home. It must be better evaluated how great is that portion, but it is difficult to consider it, since the demand forecast is based primarily on demographic data, related to home zone. The mainly challenge to implement the model was getting all the parameters necessary to apply it to real scenarios. Therefore, to identify the best data sources was the primary task. The model was detailed in order to define all sub-models and mathematical formulas and algorithmic to calculate the final impacts indicators from the simulation logic and parameters considered. Following are the considerations about the addressed elements in the developed model. Another distinct operation is the delivery from stock of stores or stores in pick-up system, the latter being similar to the operation of the pick-up points. Deliveries from stores are more common to the fast-food sectors and for medicines. The model uses and produces aggregated data by zones. It was adopted the zoning set of the Sao Paulo freight OD survey. Thus, the demand information was aggregated through overlay with other data sources to match with these zones. According to the model concept, the range of products considered in transport demand resulting from e-commerce can be aggregated in product categories, consistent with the sources of information on sales/consumption in this electronic form of commerce. However, at the logistics point of view, it was defined an additional grouping of product categories, that in general are consolidated for physical distribution, in product groups. For example, there´s categories of clothing and cosmetics, which are classified commercially distinctly, but for the logistics operation, they can be transported with the same type of vehicle and operational deliver standards. From demographic data, which is based on census tracts, consumers was ranked within each zone in consumption categories also compatible with surveys and consumption indicators available. This aggregation consider the socio-economic variables income. The daytime is separated into operational periods allowing distinguishing, for example, peak and off-peak period operation. The time of day can influence both stop times, by greater ease of parking in off-peak hours, and average speed path. 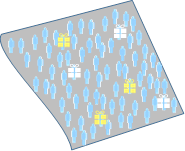 In addition, deliveries outside peak times may be favored by the most successful in deliveries due to higher probability of finding an able recipient to effect the delivery. On the other hand, deliveries at nighttime suffer from security problems, because of the suspicious of the customer to accept a delivery outside business hours. Moreover, the vehicles may generate noise that is more noticeable this time so it may disturb residents. The model is fully parameterized into specific database in order to allow to be applied to other locations, and the creation of different scenarios with variations of these parameters, making it possible to consider the application of different logistical interventions and simulate the generated results. It is important to point out that the availability of data is critical to the model, so that GIULIA system seeks to isolate this difficulty through the expected parameters and the assumptions made in the modeling to minimize the amount of required parameters. 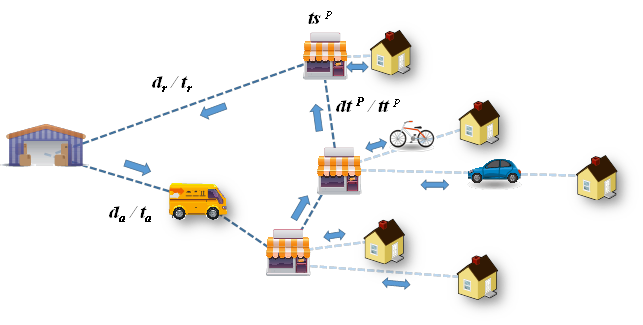 Whenever possible, the model calculates the results and indicators from mathematical modeling of different ramifications of urban logistics distribution chain. It is known that the logistics distribution chain starts from the production unit through to final destination of consumption. This chain may have different links in its sequence with transshipment sites, storage, consolidation and support points. The following figure illustrates the fractional distribution scheme of goods from a distribution center directly to the final consumer. Local deliveries from consolidation centers or local storage (last mile operation, indicated with suffix "L" in the model). 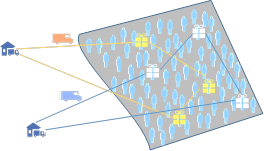 It is observed that the distribution is done through vehicles routes of delivery, and its routes are composed by some segments. They are the path that may be considered in the segment of access, from the deposit until the first delivery location (distance da and time ta), segments between local stops delivery (generic distance and time dt and tt for individual deliveries I) and each stop with generic duration (tsI). Considering logistics operation, where there is an additional level of storage or intermediate transshipment, the distribution is divided into two stages, as shown at the figure below. This type of operation applies to the case of interventions such as the use of pick-up points, or the implementation of consolidation centers or even in the case of use of non-motorized vehicles in the last mile of delivery (from transshipment points). In this case, the first stage of distribution logistics, to the places of storage or transshipment is similar to the conventional distribution operation whose scheme was presented in the previous figure. However, what changes is the significant reduction in the number of stopping points of the routes with higher volumes loads by stop, generating shorter routes, which point to use vehicles with greater capacity, and hence fewer vehicles, providing economy of scale for the transport. 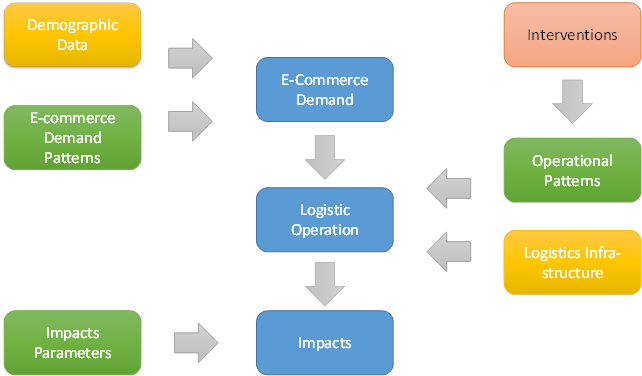 An important step in distribution logistics for e-commerce is the end segment of transport, considering the distinction in relation to traditional logistics distribution of goods, due to the spraying of delivery locations without appropriate structure to unload, since destinations are usually home addresses, and the products are small volumes units. This local distribution last step is known as the "last mile". The separate operation for the last mile is possible only when there are distribution centers, consolidation or transshipment close to final local destination. Moreover, in general, what changes is, basically, the type of vehicle used to transport, with advantages for smaller vehicles and up to non-motorized, or even on foot. Therefore, in general, logistics actions to operate in the last mile need to be combined with the inclusion of intermediate operating points for transshipment or storage. Another issue considered in the model is the success delivery rate, demanding often up to three retries delivery attempts, since it depends on the presence of someone responsible, as a rule, to receive the goods. Thus, a percentage of requests causes more than one delivery operation, with the result that the total amount of supply operations exceeds the total orders. In addition, the delivery of the logistics operation is affected by the type of recipient address. In most cases, the e-commerce´s buyer choose to receive the products at his/her home address, to be the most practical. However, there is a group of orders, for which the buyer prefers to receive in a business address, usually their workplace, in order to have more chances to have a recipient of the goods or even to have a better value freight. The distinction, from the operational point of view, basically, is reflected in stop time for delivery. In general, in commercial addresses there are hitches to make the delivery, resulting in a longer time. Moreover, there are cases of address coincidence, where at a single stop it is possible to make more than one delivery. The fixed time to find vacant parking and stopping is shared for deliveries that can be made in the same building or close to the place where deliveryman can walk on foot. In the case of creating more suitable conditions for unloading of goods, with parking lots for this purpose with places available, stop times can be reduced, and it´s an intervention whose effect can be assessed by using the model. The vehicles both motorized and non-motorized, as considered by the model, also are aggregated in basic vehicles types compatible with the availability of operational data. The choice of transport is not easy to be modeled, because the operator consider many factors. Undoubtedly, the main factor in the decision is the operating cost. In this regard, it´s seek the lowest-cost vehicle, which is, usually, the best capacity to make deliveries within the usual working hours, that is, larger vehicles are not justified, depending on the route time duration that becomes decisive in relation to the physical capacity of the vehicles. Thus, larger vehicles tend to become idle and that these are higher cost and lower operating speeds. However, extremely smaller vehicles, like the case of motorcycles or bicycles, have cargo capacity greatly reduced, being used just in routes for deliveries of smaller volumes. In particular, motorcycles are more appropriate to deliveries with reduced service time, for example, the services called “one-day deliver”, as fast food or medicine. Bicycles at reduced performance apply more to small deliveries or short routes, being affected by the city's topography and the availability of safe routes for traffic. The choice of vehicle is also affected by urban restrictions of vehicles movement, as in the case of large cities. The model considers the distribution of vehicles at each stage of distribution operation, as exogenous parameter. In order to consider the movements of vehicles from the beginning of route distribution, it is necessary to know the possible origins. This is a complex issue since the diversity of e-commerce shopping and, in addition, the various modes of distribution. The distribution logistics chain can be direct delivery from the manufacturer to the final consumer or, more usual, with storage points, transshipment or concentrations at intermediate locations. Thus, it is difficult to establish which the freight origin to be considered. As the focus of analysis model is the urban logistics, so it is understood that assessment of priority is to be the last mile stage of the distribution process. It must be observed that the initial displacement section until the beginning of the distribution and the final return to the distribution center or concentration is considered within the model. However, this component can only be calculated if there is sufficient available data. It is known that considering this shift, even with the imprecision of the data available may enable better quantitation of impact and the possibility of simulating some types of interventions, such as better use of consolidation centers. In the case of São Paulo, it was a initial possibility to use survey data from freight OD, since it could be able to extract flows for product categories that fit the e-commerce profiles. However, that survey was not planned to that detail level. The alternative that has been adopted was the use of the known key distribution centers geo-referenced database and, via gravity model, estimating the probability of the source zones near the intake zone areas with these centers. In the model, the origin is regarded as a factor to probably origin zone for each target zone of demand orders. Another very important aspect for the modeling of urban logistics distribution is to consider that the demand is met by several operators, which can be specialized for a particular online store, or be a consolidator of cargo that distributes products of several shops. Thus, the demand needs to be shared among the different active operators in order to model the level of distribution logistics efficiency reflecting the market reality. The existence of multiple operators can generate superposition of routes and increase the average distance between each stop on the route. In the model, it is considered through a number of carrier’s parameter for each zone and type of vehicle. In addition, these operators can use the deadline of products delivery to make cargo consolidation, grouping deliveries to the same region in order to have economies of scale. The average delivery time in days, is also considered as a parameter for modeling. One of the factors determining the distribution capacity of a vehicle on a route is the length of this route, made up of the time spent on the path added to stop times. Travel times can be divided into two portions. The first one referring to the initial displacement of the source warehouse to the first local stop for delivery and return, after running the last delivery to the warehouse. The other type of displacement refers to the segments between consecutive stops. In the model, the average travel time is obtained by calculating a value for the average distance between stops and adopting an average speed of travel. The average distance such as Euclidean line is calculated by means of a formulation proposed by Daganzo (1984) that obtains an estimated as being proportional to the square root of the product between the number of stops and the geographical area in question. This result is corrected in the model by a Euclidean distance adjustment factor for the actual distance considering the effective road network. To estimate the time of initial access displacement and final return, the model considers the proportion for each probable origin, with distance and transit time portions in each zone of the best route between the probable zones of origin and destination, obtained by adopting an average speed. The best path between zones was included in the system database, obtained by pre-processing routing result as a matrix of paths, expressed in passing portions in each zone of the path. It must be added to the total time of the route, the duration of stop times, estimated by parameters that define an average stop time, depending on the location type: residential, commercial or intermediate point. The model calculates the amount of routes for each zone, type of vehicle and day period, based on the capacity of each route, considering the physical limitations of maximum weight and volume supported by vehicle type, and the maximum length of operating journey. Additionally, it is considered an efficiency factor to take into account that operators, in practice, cannot operate fully effectively in the use the fleet. 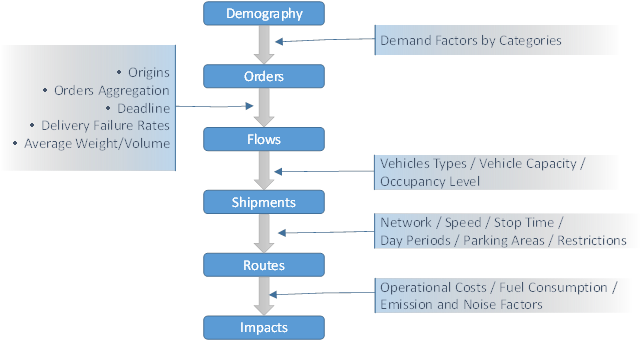 From the perspective of the physical capacity of the vehicles, the number of routes is calculated by the ratio between the total load expected for deliveries in the zone, in weight and volume, adopting average weight and volume values per delivery and per product category and the total capacity of the vehicle, taking into consideration the weight and volume units. Finally, the number of routes in the aspect of time is calculated considering a maximum duration of daily journey. The final amount of routes is obtained by the maximum limiting value between these units. The estimated fleet used for the modeled transport is calculated based on the number of routes for each vehicle type, but considering the possibility of reuse of the vehicle over a route, where there are short routes relative to the maximum journey. In this case, it is considered a time interval between consecutive routes in order to take into account the reloading time of the vehicle at the warehouse. An indicator also considered by the model is the occupation of parking spaces for vehicles that make the delivery of goods. As deliveries are sprayed, concentrating on residential areas, the impact on traffic also affects the use of parking spaces, as interference in local traffic. In the model, the indicator is calculated by the time versus occupied lots during the accumulated times of stop, considering the different types of vehicles using different individual spaces. It used a load factor by vehicle type on a car seat standard. Although cost is a questionable indicator for this type of model due to restrictions on detailed information, it is estimated the operating costs of transport, based in the logistics operations distribution for e-commerce goods, simulated by the model. The shipping cost is simply calculated based on fixed and variable cost parameters per unit of distance for each vehicle type. Costs, as well as other indicators, are calculated separately for the vehicle groups motorized and non-motorized. Other indicators are estimated related to energy consumption,pollutant emissions and noise generation that affect the environment in which the vehicles carries over. These impacts are estimated from the amount of operating hours for each type of vehicle and consumption and emission average standards factors. The whole model is focused mainly on impacts on transport logistics due to meet the demand generated by the distribution of goods from e-commerce. In addition, was considered important to measure, even if in a simplified way, the direct benefits for the buyers in buying by e-commerce mode compared to the conventional alternative of shopping in physical stores. The model for this indicator is the calculation of hours saved by the buyer, considering the total number of e-commerce purchases multiplied by the average time of travels with shopping purpose, by people in general. In São Paulo, a source available to estimate the travel time of this type is the OD survey produced by Metro. The model calculations is made considering all the data scope of an average day of operation, both in relation to the demand generation, as in logistics operations and consequently the results generated. Generally, online products are likely to be packed individually. Logistics deliveries depend heavily on the characteristics of the product and the time required. These facts make the delivery of goods a difficult issue to apprehend due to the heterogeneity of the transported goods and the different stakeholders involved. Therefore, for a better understanding of this issue it is important to consider each type of product and its delivery specificities. To do so, a classification in groups is adopted based on online product segments, weight, size and time needed for delivery. These characteristics seem to be the ones that mostly influence the delivery choice. For example, home appliance products, usually refer to bigger and heavy products, which are practically impossible to be carried by motorcycles and bicycles. The particularities of the products can restrict some interventions, in the given example, an intervention focused in changing the transport modal to bicycles in the last mile cannot be applied, in general, to home appliance products. Urban policies review (vehicle size restrictions). It is also important to consider that interventions generally do not affect all transactions, and may be partial, especially when not due to regulations and depending on the choice of operators or consumers, for example, the use of pickup points. Another aspect is that many of the operations can be combined together and may have additional impacts, for example, consolidation centers and use of non-motorized vehicles in the last mile. An operational mode of delivery, which is rather attractive from the point of view to facilitate the logistics of the dispenser and consequently implicating in a transport costs reduction, is the implementation of the pick-up points. That is the use of fixed installations in strategic locations in the city, where the buyer can withdraw the product according to his/her convenience. The idea is that the buyer choose, during the shopping process, the most appropriate place to take their goods and it may be a physical store, in the case of mixed commerce and it may be points crossing their ordinary paths, in order to minimize travel production with sole purpose of the withdrawal of products. However, in this mode, it can generate additional travel to pick-up the product. From an operational perspective, this resembles logistics to transport up to the last mile, but with the difference that the transport is provided by the buyer as an individual service, but that may or may not generate new emissions. Examples are already found with physical stores operating in the same network as e-commerce offering this service. Another innovation are establishments with automated lockers that unlocks the compartment to pick-up the product by providing the request identification information and provided purchase passwords. 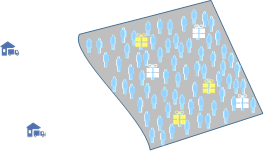 The model includes parameters to take into account this type of operation, considering a density of points installed by zone and the fraction of the demand that can opt for this mode of receipt of goods. This action concerns the change in the distribution operating hours, in order to make deliveries outside peak times or at night. The idea is to avoid hours where there is more traffic congestion and difficulty parking for unloading. In addition, at night, there is higher probability that delivery receiver is at home, in the case of home delivery. A disadvantage of the night delivery is the security issue; both the vehicle transiting at night can be an easy target for theft, as well as the robbery risk faced by buyers receiving a delivery in this period, in the case of residence delivery. There´s also the inconvenience of the time that the buyer can receive the goods in this case. Recently in Sao Paulo there has been a pilot experience for consumer goods transportation, which was reasonably successful in terms of cost for carriers. However, problems regarding the noise to the neighborhood and also security concerns, and difficulty in performing deliveries to small businesses that do not have someone to receive are negative points. At first, this type of intervention appears to be more suitable for delivery to consolidation centers and pick-up points. In terms of the model, such interference affects the vehicle travel speeds, reducing the parking time and probability of completion of delivery. Another very interesting intervention is the trend in the use of non-motorized vehicles to carry out deliveries of goods. This option is attractive for both the environmental and economic aspect. Moreover, it has great synergy with the operation of the type last mile generated by e-commerce, considering that most deliveries in low volumes that can use smaller capacity vehicles. It is important to consider local issues of each city and ease traffic for these types of vehicles, which have lower speeds and are subject to road safety issues for circulation, and are greatly affected by the city's topography. For example, Sao Paulo has a rugged terrain in most of the city and security is still a relevant factor, even with the recent deployments of exclusive lanes for bicycle traffic. Vehicles may be bicycles, cargo tricycles and other vehicle adaptations, as well as deliveries on foot to short distances. This intervention combines very well with another in the implementation of the urban consolidation centers, since the non-motorized is best suited for small distances, i.e., the last mile delivery portion. The model is fully parameterized with respect to fleet profile to be used at each stage of transport and can be used to evaluate this type of intervention. The unassisted deliveries’ intervention implantation is interesting to minimize stop time for deliveries and override frustration on deliveries. However, considering the cultural and security issue in cities like Sao Paulo, it is a very questionable delivery form. In modeling, it can be simulate their impact by adjusting the stop time and success rate of deliveries. A promising alternative to optimize the distribution of loads generated by e-commerce is the joint delivery systems. Thus, there is a reasonable economy of scale without significant additional investments in logistics. The unification of information systems and even sales is a trend observed by local operators. In addition to the gain in terms of resource sharing in sales, also the unification of stocks and the use of common vehicles, bring great benefits to operators. From the city's point of view, the joint logistics operations provides the best use of employed vehicles, reducing the amount of these, as well as in the total distance of the route, with consequent reductions in traffic interferences and environmental impacts. For the consumer, it may also reduce delivery times and to cheapen freight expenses. The model parameterize the number of operators, allowing simulate this type of intervention. The interference of unloading parking slots in urban areas caused by the e-commerce distribution logistics is quite relevant, considering the lack of parking places available in the densest regions of cities. The absence of parking, can generate greater movement of vehicles in search of vacancies, or even lead to the practice of using undue areas and traffic violations. The intervention redefinition of specific areas for unloading of goods can expedite the delivery service and reduce conflicts on urban streets. In Sao Paulo, there are a few public parking areas destined to cargo vehicles that are quite useful, but in small quantities. In the model, this type of intervention can be reflected in stop time per zone, which is one of the important parameters of the model. A major problem of urban freight logistics in large cities is the disorder caused by larger vehicles in terms of interference with other vehicles. A smart solution is to create storage points or intermediate transshipment in the city where it can be switched the type of vehicle to a minor one, or even complete the operation at different times. The smaller vehicles usage corresponds to a logistics implantation for more efficiency in last mile operation, and it can be used, including, non-motorized vehicles. Thus, consolidation centers are supplied with higher capacity vehicles, with lower cost, and this replenishment may occur in off-peak or night periods. These centers may have a more appropriate structure for unloading goods without affecting much traffic. This is a way used, in part, by companies, since there is the practice of hiring carriers, which transfer the loads from the central warehouse to own deposits, from which deliveries are made. The consolidation also relates to the grouping of different stores loads, providing economy of scale in distribution. Additionally, companies use these consolidation centers together with the deadline for deliver for group orders for each delivery area and optimize their routes and fleet use, and reduce costs. The model has parameterized variables on the amount of such centers used and the fraction of the demand that uses this kind or logistics operation. Another intervention resource in urban logistics concerns urban public policies that can be reviewed. These policies can be varied, affecting different aspects of urban distribution logistics. As examples of revisions: the prohibition of large or mid-size vehicles in urban traffic, in whole or restricted to specific times, limits for parking times, times for delivery and other rules that may lead to the practice of other interventions by operators. Transport policies are always controversial because they create conflicts, since the citizens view the trucks as urban traffic villains, but there is a permanent demand for goods that generate these flows. Thus, the regulations set by these policies equalize all factors. In the model, it´s just considered the policies of limitation on the maximum vehicle size, affecting the profile of the fleet used. In the model, in order to measure the impacts produced in urban logistics by one or more interventions, it is calculated indicators of values under different aspects. Global Result, as a general indicator, generated by weighting the others indicators, as a final grade from 0 to 5. The parameters of the model allow setting up scenarios that include one or more interventions. Different parameters can affect several aspects of logistics. In order to make easy to the final system user defines new scenarios, the database and system interface have been simplified. For each type of intervention, it´s needed to define a minimum set of parameters as factors to be applied to the data that defines the baseline scenario. In addition, the parameters can be defined for specific macro-zones or simply as general parameters valid to all macro-zones. The use of macro-zones is adopted to make the scenario definition easier, so the system propagates the parameters to all zones inside each macro-zone. To give more flexibility to the model, a demand tuning parameter has been created, which allows also simulating future scenarios, in terms of population and, consequently, the demand. This factor does not refer specifically to the applied interventions. Moreover, it can be set by population category. HESSE, M. Shipping news: the implications of electronic commerce for logistics and freight transport. Resources, Conservation and Recycling, n.36, 2002, p.211-240. OKHOLM, H, B.; THELLE, M.; MÖLLER, A.; BASALISCO, B.; ROLMER, S. E-commerce and delivery: A study of the state of play of EU parcel markets with particular emphasis on e-commerce. Copenhagen Economics, July, 2013. NEMAT, R. Taking a look at different types of e-commerce. World Applied Programming, vol.1, n.2, June, 2011, p.100-104.